A perfect example of what grows together, goes together, this dish demonstrates why cooking in season will set you up for success simply by pairing the vegetables harvested at the same time with herbs and flavors that are natural partners. It’s the finest way to eat. Autumn arrived at the market this weekend in the form of a slight and promising breeze, and farmers' fields' harvest still abundant from recent rains. And rains. Then some rain. And one more day of rain. Oh, did I mention HUMID? But still, the high temperatures remained in the mild mid 80s and we Texans gave a collective sigh of relief. Summer can be rough on us. The change in climate motivated me to get cooking, (I'm salad'd OUT!) 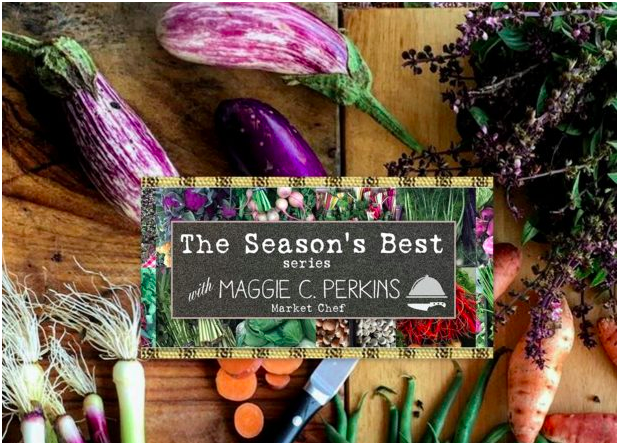 so I collected seasonal vegetables, and inspiration, from the bounteous tables of Johnson's Backyard Garden. And even asked for the recipe! So for those intrepid augbergine/squash/sweet pepper newbies, and YOU, try this easy dish and reintroduce yourself to early autumn fare. In a large skillet over medium high heat, bring neutral cooking oil to a shimmer. Add sliced potatoes, and brown on each side, tossing frequently. 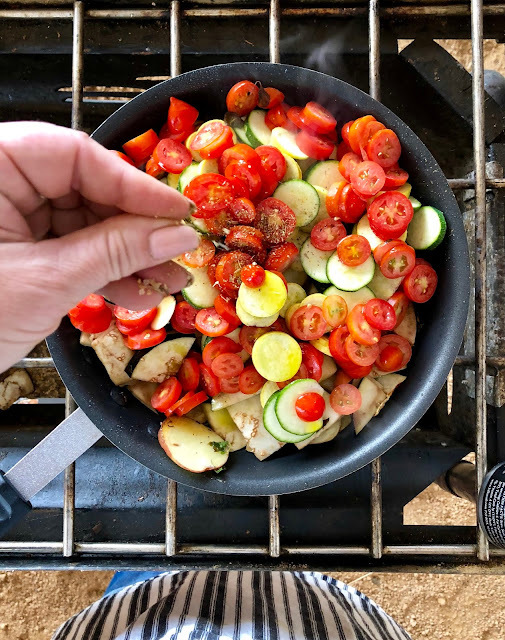 Add zucchini, summer squash, eggplant, and sweet peppers to pan, adding oil if necessary to keep vegetables moving freely in the pan. Toss frequently, cooking until limp. Add tomatoes and whites of scallions. Toss well and cook for 3 minutes, or until tomato skins begin to break and release tomato juices. Add broth and oregano, bringing to a rolling simmer, and cover. Cook about 10 minutes, or until all vegetables are tender to preference. Add Herbes de Provence, salt, and freshly cracked pepper to taste. Remove from heat and cover. Let stand for 5 minutes covered, off heat, prior to serving. Garnish with sliced scallion greens. A crusty baguette with a smear of salted butter, maybe a chunk of your favorite cheese, or for meat-eaters, sautéed scallops, firm white-fleshed fish, or a poached chicken breast might be just the thing to round out this early fall vegetable dish into a hearty meal. Wine Pairing: Once home, I recreated this dish for myself with a few tweaks, and pulled out a orange-sized ball of whole grain bread dough to bake off dinner rolls to serve alongside. This overcast, slightly cooler first of Autumn afternoon seemed like the perfect setting in which to pair wine with the quick dish, so as the dough rose prior to it’s baking-stone cook-off, I uncorked a hostess gift graciously given by a student, recently, Belleruche Cotes-du-Rhone 2016 Rose, from M. Chapoutier winery in France. 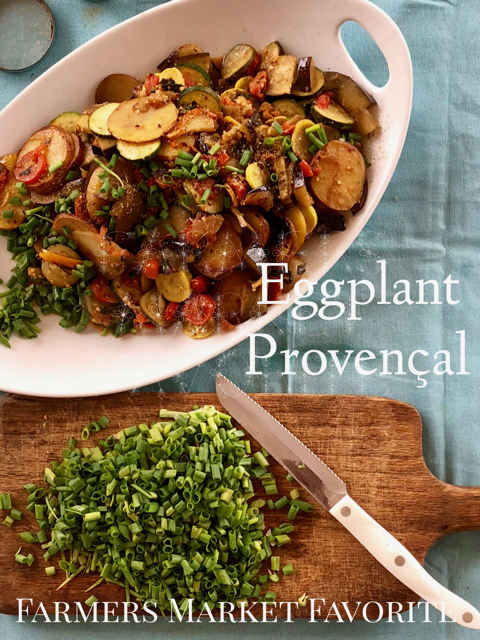 It’s an economical bottle, usually found around $10, made with Grenache, Cinsault and Syrah grapes, and paired perfectly with the complex marriage of late summer vegetables. If you're in the Austin area this weekend, please stop by the TFM Lakeline from 10-12 on Saturday, or the TFM Mueller from 11-1, Sunday, for a taste of the the Season's Best! I'll be happy to see your smiling face! It's really the best part of my job.